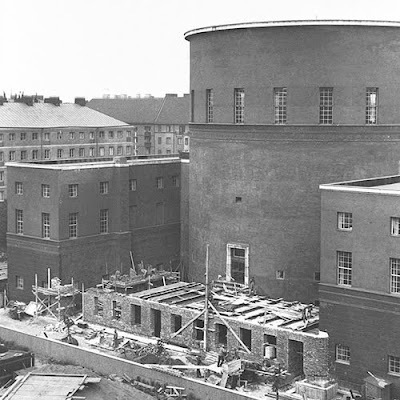 when the famous stockholm city library building - designed by gunnar asplund - was first inaugurated in 1928, it looked quite different from today. only three sides of the square box had walls. the fourth side, in the rear, was left open, thus exposing the tall, slender central cylinder/rotunda from the top all the way to the ground. somehow i always liked this dramatic “look” better than what the building became a decade later - when a fourth side was built: ever since, the base of the rotunda/cylinder remains all covered-up and hidden from view on all four sides. still, it was gunnar asplund, the original architect, who himself got the chance to add to his own original design. but, in my opinion, asplund should not have covered the fourth side. he should have tried to find a way to leave the cylinder exposed, also as the needs of the library grew with time. though i have never, in real life, seen the library the way it looks in early photographs, those early photographs always made me miss the exposed cylinder - if missing something you’ve never actually experienced is at all possible - when passing right next the building in the street, or when catching a glance of the top of the cylinder from nearby “odenplan” square. or when looking down from the steep, wuthering heights of the “observatorielunden” park next to the library (thinking to myself “what if...”). no such proposals among the competition entries, to my knowledge. probably since the library is in lack of floor space anyway: tearing down almost a quarter of its present day volume would require the new addition to be even larger than stated in the competition brief. but, personally, i think making such an addition to the volume of the newest addition would have been advisable - if only to make possible the tearing down of asplund’s own (mediocre by comparison) addition; to make exposing the rotunda/drum/cylinder possible again. exposing it again would be so cool. in the wake of the competition, with the winning design scheme being questioned by just about every critic who reviewed the competition result, the idea of just forgetting the competition ever took place, and start afresh, is suggested frequently. if a new main building for the city library is in fact built somewhere else in the city, and not as any addition to the old main building (which more and more critics are proposing as the best alternative to erecting the winning proposal. and i have to agree with them all. the jury’s efforts and the winning proposal were equally disappointing. i believe reporter elisabet andersson explained it better than anyone else. read her account of what made the competition go all wrong, in this article), then it would actually be possible to tear down the fourth side/the first addition to the library. because asplunds library would no longer have to meet the requirements of the modern main branch for all the many branches of stockholm city library (there are many branches). 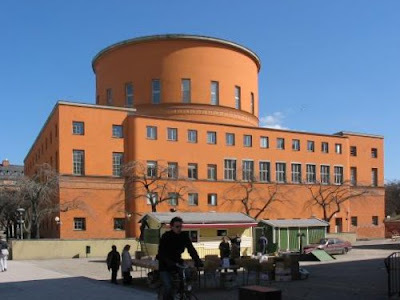 when time comes to reinvent the library building of gunnar asplund’s - after having moved the main library branch somewhere else - exposing the rotunda once again could (should!) be made one of the prerequisites of such a reinvention process. after all: art is reduction. architecture is reduction. adding more and more to the original design certainly makes it more and more functional - but also diminishes the original’s architectural impact more and more with every addition. if the trivial, functional requirements of a main library can be provided for in a better way somewhere else in the city, the architectural impact of asplund’s design can again be heightened to the level of its early glory days. by pulling down the fourth side of the square. so - yes, i say, please find some other place for the future main library branch. which place, then? the “slussen” district has already been proposed by many critics as a suitable spot. i myself have another, i think better, idea. i will explain my proposal for cleaning up the city library mess in the very near future, here, on this blog - a proposal which in fact would clean up another mess in the city as well, and thus kill two problematic birds with one stone. stay tuned!